This article is about the music genre. For the record label, see Acid Jazz Records. For the wrestler, see Da Soul Touchaz. Acid jazz, also known as club jazz, is a music genre that combines elements of jazz, soul, funk, and disco. Acid jazz originated in the London club scene of the mid-1980s in the rare groove movement and spread to the US, Japan, Eastern Europe, and Brazil. Major acts included the Brand New Heavies, Incognito, Us3, and Jamiroquai from the UK and Buckshot LeFonque and Digable Planets from the US. The rise of electronic club music in the mid to late 1990s led to a decline in interest, and in the twenty-first century, the movement became indistinct as a genre. Many acts that might have been defined as acid jazz are now seen as jazz-funk, neo soul, or jazz rap. 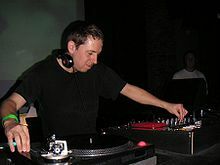 The genre got its name in 1987 from Gilles Peterson, a disc jockey in London. The name is a play on the acid house genre, which was popular in UK clubs in the 1980s. Acid jazz consisted of two related movements. The first was based on records released by DJs and producers that included rare jazz tracks, particularly from the 1960s and 1970s, often mixing them with percussion tracks and electronic dance beats. The second were groups influenced by these recordings and who emphasised a groove-based approach to music. Acid jazz uses elements of jazz, funk and hip-hop. Because of its existence as a percussion-heavy, primarily live music, it was closer to jazz than any other dance style, but its focus on maintaining a groove allied it with funk, hip-hop, and dance music. The style is characterized by danceable grooves and long, repetitive compositions. Typical ensembles include horns, a full rhythm section (often with a drum set and additional percussion), a vocalist that may sing and rap and often a DJ. Acid jazz has its origins in the 1960s, when psychedelic styles were being incorporated into other musical genres, jazz being one of these. Some cite "Six Pack" and "Soul Fiesta" by The Apostles (1969) as acid jazz records during the 1960s. Acid jazz became popular in the London club scene of the mid-1980s, with DJs of the rare groove movement, who played obscure jazz records. Their main interests were in the fringe of jazz fusion, jazz funk, and with lesser input from soul jazz of the 1950s and 1960s. Particularly significant were records from the Blue Note catalogue. These DJs included Gilles Peterson, who had residencies at several London clubs in the 1980s, began in his own small pirate radio station and then moved to the much larger Kiss-FM. In 1988 with producer Eddie Piller he formed the label Acid Jazz Records. The first release from the company was the compilation Totally Wired, which contained obscure jazz funk tracks from the 1970s with updated new tracks. In 1990 Peterson left to found his own label Talkin' Loud at Phonogram. The company signed acts such as Galliano, Young Disciples and Urban Species. Another British record label, Fourth And Broadway Records, was formed in 1990 and began a compilation series with the title "The Rebirth of Cool". Artists included Pharoah Sanders, Stereo MCs, the French rapper MC Solaar, Japanese production team United Future Organization and saxophonist Courtney Pine. In 1991 the genre broke into the mainstream with the success of Brand New Heavies. After one eponymous album (1990) with Acid Jazz Records the group moved on to FFRR Records for their hit singles "Never Stop" and "Dreams Come True". 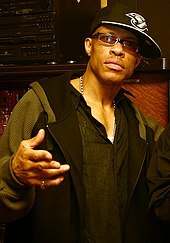 Other bands included Incognito and Us3, whose "Cantaloop (Flip Fantasia)" (1993) was the biggest hit in the genre. Also highly successful were Jamiroquai, who, having been an early signing for Acid Jazz Records, signed for Sony Music for their highly successful album Travelling Without Moving (1996), which spawned the international hit single "Virtual Insanity". Other live acts included Stereo MC's and the James Taylor Quartet. The initial mainstream success of acid jazz was followed by a large number of compilations that left the public confused as to the nature of and key performers in the genre. In the early 1990s local acid jazz scenes developed in the US. It reached New York in 1990 when British promoter Maurice Bernstein, and his South African partner, Jonathan Rudnick opened Groove Academy as a party at the Giant Step club in the basement of the Metropolis Café in Union Square. From this Groove Academy developed into a record label and media company. Other acid jazz recording artists in New York were Brooklyn Funk Essentials (Doublemoon), DJ Smash (Eightball Records), and Jerome Van Rossum (Irma Records). In San Francisco there was Ubiquity Records and in Los Angeles Solsonics. Notable acid jazz groups that emerged from this scene included A Tribe Called Quest, who borrowed from a variety of jazz sources for their Platinum-selling The Low End Theory (1991), Buckshot LeFonque, a project of Branford Marsalis, and Digable Planets, who were awarded a Grammy for their 1993 single "Rebirth of Slick (Cool Like Dat)". Formed in New York in 1990, Groove Collective produced their self-titled debut in 1993 and have continued to be influential into the twenty-first century. The rapper Guru released a series of collaborative albums with major figures in jazz as the Jazzmatazz series. From Chicago, Liquid Soul achieved a national profile from 1996 when their self-titled debut LP was re-released on the Ark21 label. Acid jazz soon gained an international following, including in Japan, Germany, Brazil and Eastern Europe. From Japan, United Future Organization gained an international reputation, signing an American record deal in 1994. Other notable artists from Japan included Mondo Grosso, and Gota. From Eastern Europe came bands such as Skalpel from Poland. The rise of electronic club music in the mid to late 1990s led to a decline in interest in acid jazz among the record buying public, although the genre continued to have a reduced worldwide following. In the twenty-first century the movement became so intertwined with other forms that it became indistinct as a genre and many acts that might have been defined as acid jazz are now seen as jazz funk, neo soul or jazz rap. Q magazine stated "Acid jazz was the most significant jazz form to emerge out of the British music scene". One major legacy of the genre was on the jam band movement, with acid jazz proving a suitable medium for extended improvisation for acts such as Medeski, Martin and Wood. ^ Cook, Richard (2005). Richard Cook's Jazz Encyclopedia. London: Penguin Books. p. 2. ISBN 0-141-00646-3. ^ Adams, Simon (2002). Kernfeld, Barry, ed. The New Grove Dictionary of Jazz (2 ed.). New York: Grove's Dictionaries Inc. p. 10. ISBN 978-1-56159-284-5. ^ a b c d e f g h i j J. Bush, "Acid Jazz", in V. Bogdanov, ed., All Music Guide to Electronica: The Definitive Guide to Electronic Music (Milwaukee: Backbeat Books, 2001), ISBN 0-87930-628-9, pp. 647–9. ^ a b c d e f E. G. Price, T. L. Kernodle and H. J. Maxile, eds, Encyclopedia of African American Music, Volume 3 (Santa Barbara, California: ABC-CLIO, 2011), ISBN 0-313-34199-0, pp. 479–82. ^ a b c d Ted Gioia, The History of Jazz (Oxford: Oxford University Press, 2nd edn., 2011), ISBN 0-19-983187-4, pp. 333–4. ^ a b c "Acid Jazz", Allmusic, retrieved 6 January 2014. ^ Mick Berry and Jason Gianni, The Drummer's Bible: How to Play Every Drum Style from Afro-Cuban to Zydeco (See Sharp Press, 2004), ISBN 1-884365-32-9, p. 68. ^ Larkin, Colin (1998). The Virgin Encyclopedia of Dance Music. Virgin Books. p. 334. ISBN 978-0-7535-0252-5. Retrieved 2 July 2013. ^ a b H. Martin and K. Waters, Jazz: The First 100 Years (Cengage Learning, 3rd edn., 2011), ISBN 1-133-16927-9, p. 362. ^ Mervyn Cooke and David Horn, eds, The Cambridge Companion to Jazz (Cambridge: Cambridge University Press, 2002), ISBN 0-521-66388-1, p. 237. ^ J. Ankeny, Liquid Soul: biography, Allmusic, retrieved 9 January 2013. ^ J. Ankeny, "United Future Organization", in V. Bogdanov, ed., All Music Guide to Electronica: The Definitive Guide to Electronic Music (Milwaukee: Backbeat Books, 2001), ISBN 0-87930-628-9, p. 536. ^ Erlewine, Stephen Thomas. "Biography: Gota". AllMusic. Retrieved 23 July 2010. ^ C. Larkin, The Encyclopedia of Popular Music, Volume 7 (Oxford: Oxford University Press, 4th edn., 2006), ISBN 0-19-531373-9, p. 503. ^ Du Noyer, Paul (2003). The Illustrated Encyclopedia of Music (1st ed.). Fulham, London: Flame Tree Publishing. p. 144. ISBN 1-904041-96-5. ^ Michael Endelman (March 28, 2000). "*** Luke Vibert and BJ Cole STOP THE PANIC (Astralwerks)". Online Magazine (music review). Boston Phoenix. fifth paragraph from top. Retrieved June 24, 2011.